Robert Altman—visionary director, hard-partying hedonist, eccentric family man, Hollywood legend—comes roaring to life in this rollicking cinematic biography, told in a chorus of voices that can only be called Altmanesque. After an all-American boyhood in Kansas City, a stint flying bombers through enemy fire in World War II, and jobs ranging from dog-tattoo entrepreneur to television director, Robert Altman burst onto the scene in 1970 with the movie M*A*S*H. He revolutionized American filmmaking, and, in a decade, produced masterpieces at an astonishing pace: McCabe & Mrs. Miller, Thieves Like Us, The Long Goodbye, 3 Women, and, of course, Nashville. Then, after a period of disillusionment with Hollywood—as well as Hollywood’s disillusionment with him—he reinvented himself with a bold new set of masterworks: The Player, Short Cuts, and Gosford Park. Finally, just before the release of the last of his nearly forty movies, A Prairie Home Companion, he received an honorary Oscar for lifetime achievement from the Academy, which had snubbed him for so many years. 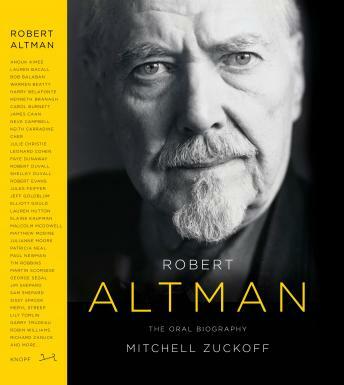 Mitchell Zuckoff—who was working with Altman on his memoirs before he died—weaves Altman’s final interviews, an incredible cast of voices, and contemporary reviews and news accounts, into a riveting tale of an extraordinary life. Here are page after page of revelations that force us to reevaluate Altman as a man and an artist, and to view his sprawling narratives with large casts, multiple story lines, and overlapping dialogue as unquestionably the work of a modern genius.